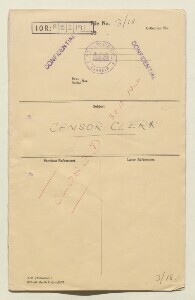 In August 1939, anticipating the outbreak of war in Europe, the Government of India sanctioned the interception of post for examination and censorship in the Gulf. Three clerks were appointed at Bahrain, Kuwait and Muscat. Detailed instructions were sent to the Political Agents at these locations. These secret notes were provided for information and guidance for the new clerks who would carry out the interception and censorship work. Successful interception work, according to these instructions, depended on secrecy, speed and manual dexterity. Therefore, ‘censorship officers should be selected for intelligence, skill and discretion’. The need for the utmost secrecy is stressed in the notes and ‘the fact that censorship is being undertaken should be known to the smallest number of persons possible and only to those directly concerned’. In addition, interception and censorship could only be carried out successfully if the goodwill of Postmasters was obtained. The officer concerned should take them ‘into his confidence in this matter and impress upon them the need for safe-guarding the secrecy of the intercept’. The notes provide various methods of interception, and stress that ‘what may be a suitable method in the Punjab in the hot weather will obviously not work in Burma in the rains’. Therefore, ‘it is for provinces to adopt the methods they think the most suitable’. These methods included steaming, damping and rolling the gummed flap to open the envelope, as well as heating it with a ‘hot dhobi’s iron’ (a laundryman’s iron). In all cases, the operator’s hands ‘must be very clean’ and ‘[n]o force must be used’. When re-closing letters that had been opened for examination, it was essential that all contents be replaced ‘exactly as they were found’ and for ‘all enclosures, no matter how minute or insignificant […] to be reinserted’. High quality gum or paste should be used to re-close the letter, sparingly applied with a camel hair brush. It was evidently understood that postal censorship would be carried out since some correspondents took measures to evade interception. One such method was the use of various kinds of invisible inks, also known as ‘sympathetic inks’. Secret messages could be written on blank sheets of paper, but could also appear between lines of ordinary visible text, in the margins of documents and on envelopes. Methods of producing invisible ink included: cobalt chloride diluted in water; warm water in which rice has been soaked; and a mixture of onion juice, lime juice and milk. Writers could also attempt to evade detection by writing with the head of a live match on wet paper. A mixture of saliva, diluted urine, diluted gum and certain kinds of perfume could also produce invisible writing, but, as the guidance notes, this is ‘comparatively easy to detect’. According to the instructions, there were two ways to detect the presence of invisible writing. The first was to hold up a suspected document obliquely in sunlight. The second method involved applying iodine vapour to the paper. The notes instruct that iodine fumes could be produced by placing a few iodine crystals in a beaker rested on wire gauze on top of a tripod over a spirit lamp. This was the method par excellence as it is noted that it ‘will develop nearly all sympathetic inks’. Most importantly, this method of reading secret messages left no trace if the paper in question was afterwards subjected to sunlight or dry warmth. The guidance for censor clerks demonstrates that it was as important for those intercepting post as it was for those writing secret messages that passed through the Gulf postal agencies to evade detection.